Suiden | Providing comfort for a production site. We think that ‘making a flow of air ‘ is the basis to create a comfortable environment. Therefore, including summer-season products such as industrial fans and spot cooler, we manufacture a variety of ventilation equipment for roofs, walls, and narrow spaces. Furthermore, we have been developing a compact dust collector and industrial vacuum cleaner that can clean even cutting oil-both of which contribute to realize the clean working environment. We, as a manufacturer for environmental equipment, take advantage of the accumulated know-how for further development in such area as design, planning and manufacturing. In this page, the production system at Suiden and each department’s detail are introduced. The basic concept of our products, ‘Comfort for a working environment’ is described here. Suiden's aim and solutions for our customers. This is what we always think of. We develop and manufacture products to solve these problems for you. and named after Suiden’s symbol-hane [Fan blade]-and yume [dream]. 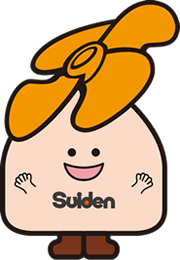 Copyright© Suiden Co.,Ltd. All Rights Reserved.